I’ve been on the lookout for a service that would reliably speed up various web projects such as FantasySP and Top IAmA. The faster the pages load, the happier my users will be. I first started out using Cloudflare, but their service has been getting worse and worse. Their pay features aren’t worth the money and using Cloudflare will most likely slow down response times. A winning combination! Then I heard Google PageSpeed was in invite only beta. (Not to be confused with mod_pagespeed, which is an Apache module that offers very similar features). Google PageSpeed Service is very similar to cloudflare and all traffic will be passed through their servers via a DNS change. I was finally accepted into the program and have spent the past few days tweaking my sites for best performance. Though before we get to the results, let’s first go over why FantasySP tends to load a little slow to begin with. Google PageSpeed went live on Christmas day, the 25th. Immediately all pages started to load in under 5 seconds. Best of all, no functionality on the site was broken, and I did not detect any additional latency by using Google’s service. On December 26th I decided to enable additional experimental features that are labeled “high risk”. I also enabled a new low risk feature called prefetch DNS resolve. According to my testing, the previous bottlenecks like advertisements and rendering Google Charts no longer slow down pageloads. Next up is to see performance from Google Webmaster Tools. When I used Cloudflare, Googlebot noticed huge performance issues. Cloudflare caused my 200 ms response times to double and even triple. Will the same results appear for Google’s Service? As you can see, passing traffic through Google PageSpeed servers does cause a penalty of about 100 ms in response times. Their servers are doing an awful lot of optimizations behind the scenes, so this is not at all surprising. The trade off is that the end user gets entire seconds shaved off their load times. I think I’ll take that any day. Of course, I am not satisfied there and wanted to further push the boundaries of what Google PageSpeed Service can do. Next up is to cache and prioritize visible content. Cloudflare has something similar, but they call it railgun. Railgun also requires you to run an extra process to send HTTP data back and forth to Cloudflare to show them which HTML content is stale so it can be cached. I have no idea how well Railgun performs since no one has actually reviewed the service. You’ll notice two things about this graph… 1) The response times to the far left are terrible and 2) The response times under Google PageSpeed with cached content are extremely fast. Response times went from 200ms to around 50 ms. The response times to the far left are a result of Cloudflare’s Full Caching features with Rocket Loader enabled. As I mentioned earlier, avoid Cloudflare at all costs. The response times in the middle of the graph are from my server. 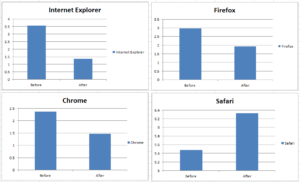 I broke up the data by browser and they include: Chrome, Internet Explorer, Safari, and Firefox. Internet Explorer comes in just a hair faster than Chrome. Although Safari seems to be worse. According to NewRelic browser metrics and testing, Google PageSpeed Service offers significant improvements to load times. It is relatively easy to set up and is better than any other competing service. Sites both big and small should use at least some of the services provided. Google PageSpeed Service with advanced optimization techniques is a perfect solution when it comes to simple WordPress blogs that use Disqus commenting. All you have to do is add an ignore rule for /wp-admin/* and enjoy a much faster blog that should be able to handle an almost unlimited amount of visits and traffic. I’d love to see results from anyone else out there willing to try. Overall I’d say using Google PageSpeed is a no brainer. Test it out and let me know your thoughts. Update #1: Over at the hackernews thread, Jeff Kaufman, who works with the PageSpeed team gave some very insightful comments that are a must read. Update #2: This blog you are currently reading now uses Google PageSpeed Service with advanced caching techniques, such as Google’s cache and prioritize visible content.